Centre-surface slitter rewinders are supplied for a multitude of web converting applications. The main benefit of this type of slitter over the standard two bar centre-rewinding machines is that the distance between where the product is slit and then rewound always remains constant unlike with standard centre-rewinding machines. 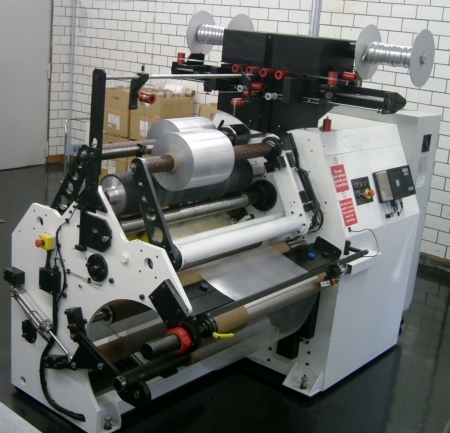 This type of machine is therefore ideal for slitting and rewinding of very narrow width coils. These duplex rewind centre-surface slitters can also have the facility to gap rewind, effectively keeping the rewinding slit coils as close as possible to the main surface drum roller without actual physical contact. This is most important when slitting and rewinding of materials which are pressure sensitive or materials that cannot have any surface contact for risk of scratching or burnishing of the product face.